Lent starts next Wednesday and with it starts my resolution to give up meat as much as possible. It seems like my family (with the exception of mom), loves meat a little too much. Eating more meatless dinners will help us to make a Lenten sacrifice as a family. 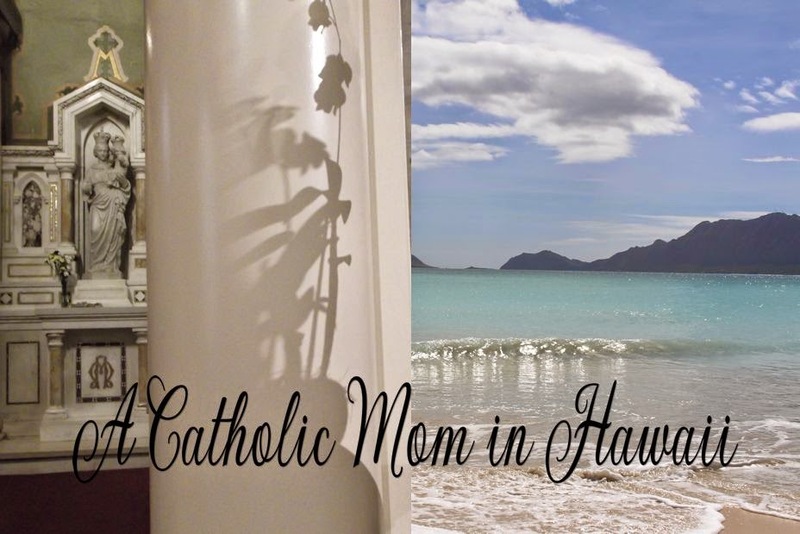 I plan on sharing these Lenten recipes on this blog. I do have a cooking and garden blog, but I think I will share it with my friends here. Today, I will share the recipe for Swiss Chard and Beet Tops Pie. I made the pie last night in order to utilize the very fresh huge beets, tops and all and large Swiss chard leaves my friend shared with me yesterday afternoon. I originally wanted to use phyllo leaves to a kind of Spanakopita but as usual, I wanted to use what I had at hand. Therefore, I used a ready-made pie crust. Next time I will make the pie crust from scratch because that way the salt content can be controlled. 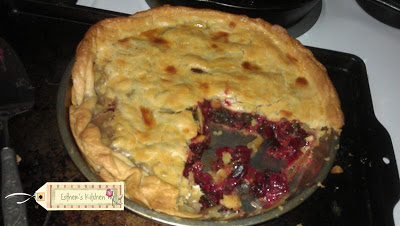 The original recipe I found for Swiss Chard Pie was Martha Stewart's and it can be found here. I modified it in order to be able to use the cast iron skillet instead of cooking the greens in a pot and to cook the greens in a manner I am more accustomed to preparing. Two pie crusts (ready-made or home made) Place one crust into a deep pie plate or cake can. 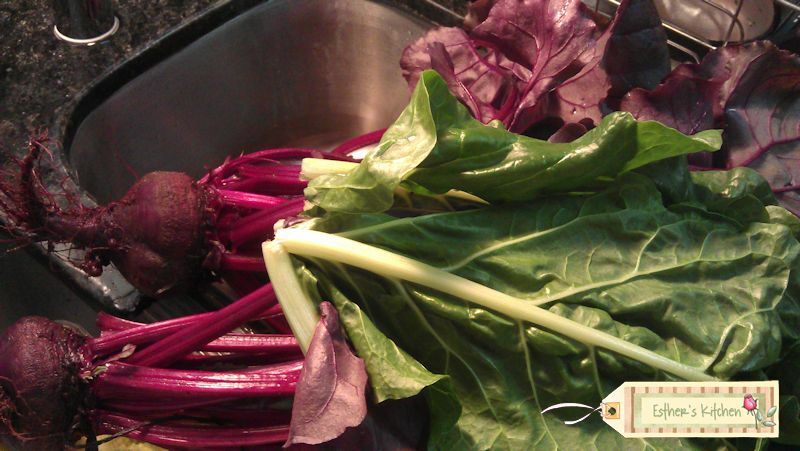 Approximately 6 cups of combination of fresh Swiss chard leaves and/or beet tops (wash and remove most of the moisture but they don't have to be very dry). 1 tablespoon lemon juice and lemon zest. I used Meyer lemon juice and unfortunately, the zest has no flavor. After washing the greens, remove the stems and slice them all thinly. Heat a large cast iron skillet. Add the olive oil along with the garlic and onions. Fry until the onions are translucent. Add the stems and cook until the stems are soft, approximately 5 minutes over medium heat. Add the red pepper flakes or Cayenne pepper. Remove everything to a bowl. Add a little more oil and add the torn leaves into the skillet. Cover the skillet with a lid and lower heat. Since the leaves should still be a little moist, no water is needed to be added. Cook until all water is absorbed and leaves are cooked. Add the cooked leaves to the bowl containing the cooked stems. Toss with the cheese, flour and lemon juice (and zest). Add this point, a little salt and pepper can be added to season the filling. Pour into the pie crust and cover with the second pie crust. Press and seal carefully. Cut slits into the top. You can brush an egg wash on top of the pie crust to give it a nice golden glaze. Bake for 30 minutes or until golden grown. Serves approximately 6 people for dinner. 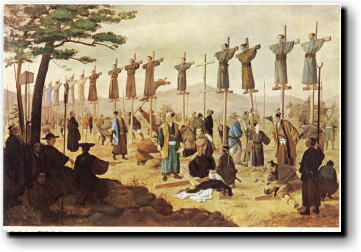 In 1592 the persecution was renewed, and several Japanese converts received the crown of martyrdom. The emperor Tagcosama, one of the proudest and most vicious of men, was worked up into rage and jealousy by a suspicion suggested by certain European merchants desirous of the monopoly of this trade, that the view of the missionaries in preaching the Christian faith was to facilitate the conquest of their country by the Portuguese or Spaniards. Three Jesuits and six Franciscans were crucified on a hill near Nangasaqui in 1597. The latter were partly Spaniards and partly Indians, and had at their head F. Peter Baptist, commissary of his order, a native of Avila, in Spain. 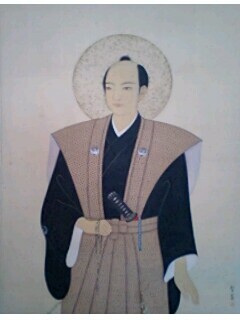 As to the Jesuits, one was Paul Miki, a noble Japanese, and an eminent preacher, at that time thirty-three years old. The other two, John Gotto and James Kisai, were admitted into the Society in prison a little before they suffered. Several Japanese converts suffered with them. The martyrs were twenty-six in number, and among them were three boys who used to serve the friars at mass; two of them were fifteen years of age, and the third only twelve, yet each showed great joy and constancy in their sufferings. Of these martyrs, twenty-four had been brought to Meaco, where only a part of their left ears was cut off, by a mitigation of the sentence, which had commanded the amputation of their noses and both ears. They were conducted through many towns and public places, their cheeks stained with blood, for a terror to others. When the twenty-six soldiers of Christ were arrived at the place of execution near Nangasaqui, they were allowed to make their confession to two Jesuits of the convent in that town, and being fastened to crosses by cords and chains about their arm. and legs, and an iron collar about their necks, were raised into the air, the foot of each cross falling into a hole prepared for it in the ground. 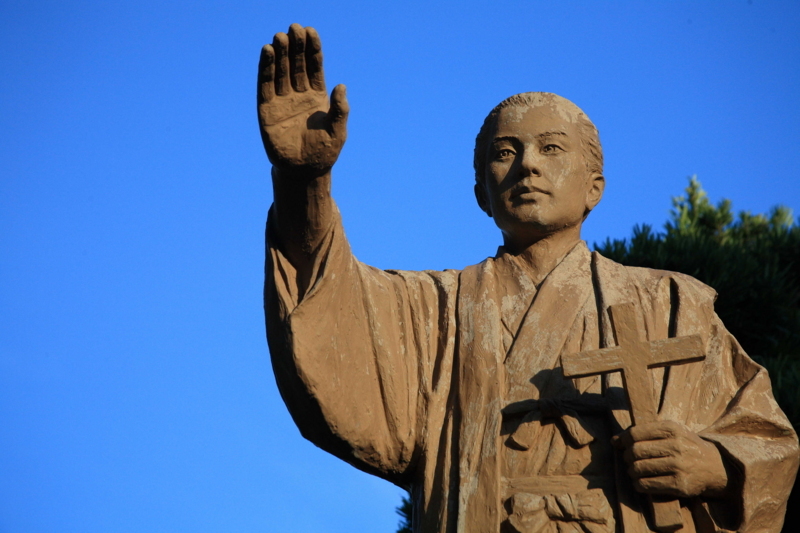 The crosses were planted in a row, about four feet asunder, and each martyr had an executioner near him with a spear ready to pierce his side; for such is the Japanese manner of crucifixion. As soon as all the crosses were planted, the executioners lifted up their lances, and at a signal given, all pierced the martyrs almost in the same instant; upon which they expired, and went to receive the reward of their sufferings. Their blood and garments were procured by Christians, and miracles were wrought by them. Urban VIII ranked them among the martyrs, and they are honoured on the 5th of February, the day of their triumph. 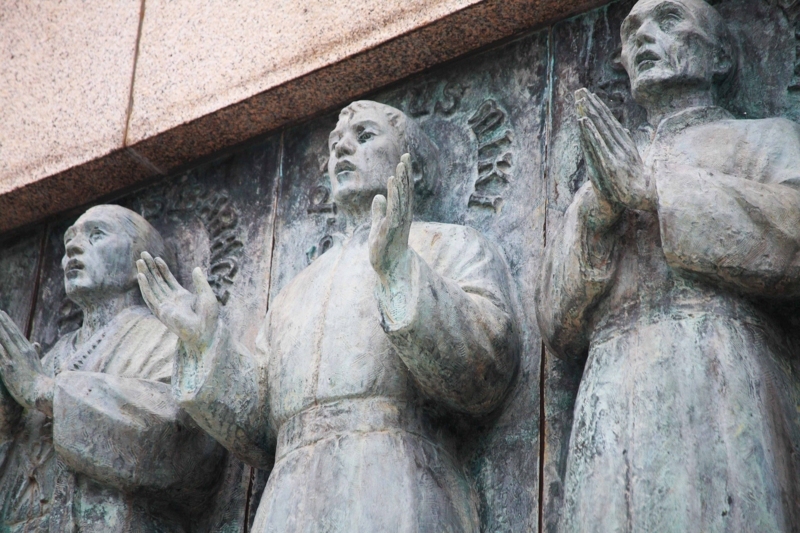 Detail of the Twenty-six Japanese Martyrs relief pictured below. 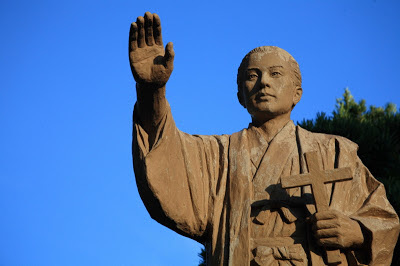 The three photos above were from a wonderful blog maintained by Japanese Jesuit priest Father Hiroshi Katayanagi. 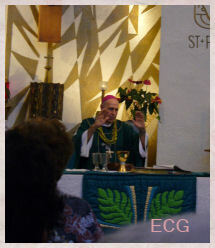 You can visit Father's blog here. Among his beautiful photos are those of a recent pilgrimage he made in Nagasaki. 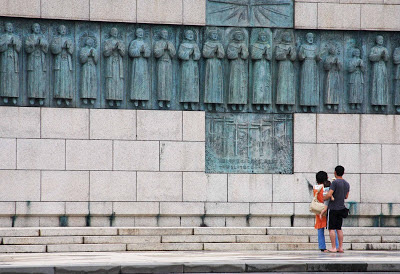 One photo that struck me was the one of the Catholic physician Dr.Takashi Nagai whose spiritual book Song for Nagasaki recounts the impact the Nagasaki bombings had on his family, himself and his faith. So on this, the feast of St. Paul Miki, Jesuit priest who died at the same age as our Lord, and in the same manner of death, and along with his companion, let us hold them as models for our own Christian life. They walked hundreds of miles to their place of execution. They were killed for their faith but never did they despair. They instead praised God with recitations of the psalms and prayers as they were being martyred. They died steadfast and strong because of their deep faith. Oh, if only he had been president of our own United States of America! 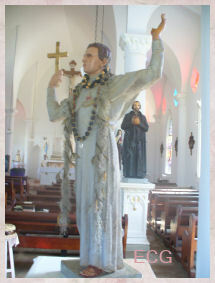 Gabriel Garcia Moreno was a Catholic, a President and a Martyr. 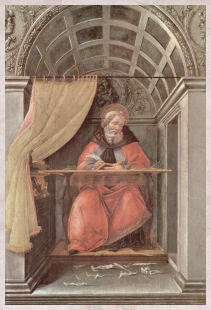 He valued his precious Faith more than anything in his life and, in his youth, he formed a program of spirituality that he kept all the days of his life in spite of the horrendous demands made upon his time and energies. He lived in times violent and corrupt, and is a wonderful ideal of father, husband and soldier of Jesus Christ. 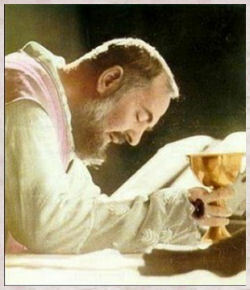 Every morning when saying my prayers, I will ask especially for the virtue of humility. Every day, I will hear Mass, say the Rosary, and read a chapter from the Imitation of Christ. I will take care to keep myself as much as possible in the presence of God, especially in conversation, so as not to speak useless words. 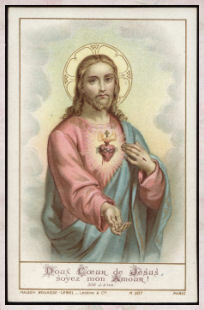 Before beginning any action, I will offer my heart to God. I will say to myself continually: "I am worse than a demon and deserve Hell"; when I am tempted, I will ask myself: "What will you think of this in the hour of your last agony?" In my room, I will never sit to pray when I can do so on my knees or standing. I will practice little acts of humility, like kissing the ground for example, and desire all kinds of humiliations, while taking care at the same time not to deserve them, I will rejoice when my actions or my person are abused or censured. I will never speak of myself, unless it be to own my defects or faults. I will make every effort, through the thought of Jesus and Mary, to restrain my impatience and contradict my natural inclinations, striving to be patient and amiable even with people who bore me. Never will I speak evil of my enemies. Every morning, before beginning my work, I will write down what I have to do, being very careful to distribute my time well, to give myself only to useful and necessary business and to continue it with zeal and perseverance. I will scrupulously observe the laws of justice and truth, and have no intention in my actions save the greater glory of God. I will make a particular examine, twice a day, on my exercise of different virtues, and a general examination every evening. 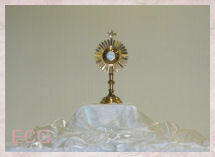 I will go to Confession every week. I will avoid all familiarities, even the most innocent, as prudence requires. I will never pass more than an hour in any amusement and, in general, never before eight o'clock in the evening. 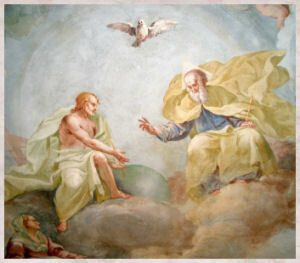 The one ambition of his noble soul was the reign of God in the souls of men. 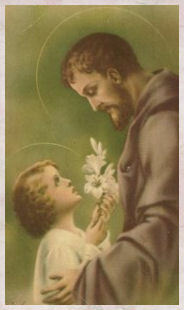 He had a great and tender love for Our Blessed Mother. 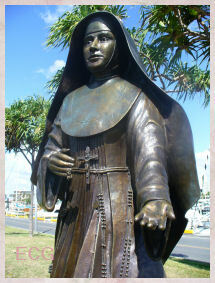 He restored the shrine of the Lily of Quito. 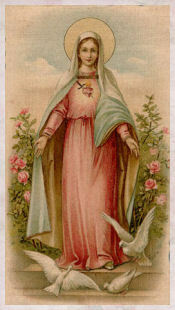 He would ask his people, visitors or workers, "Do you love the Blessed Virgin Mary? If they answered, "Oh! YES, with all our hearts," he would say, "Well then, my children, let us kneel down all together and pray Her Rosary that we may persevere in loving and serving God." 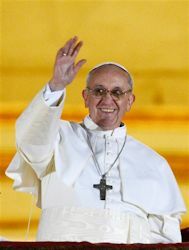 "A Catholic People Cannot Socially Deny Jesus Christ!" The secret society of Freemasonry seeks to unite itself with the devil to destroy the reign of Jesus Christ upon earth, to destroy Christianity. It is the great enemy. 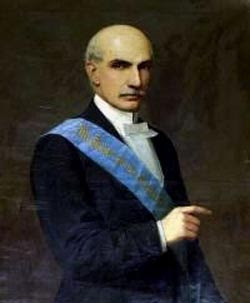 Their rage against Garcia Moreno was universal and all Freemasonic newspapers throughout the world held him up for execution and he was solemnly condemned to death by their Great Council. At the opportune moment, the assassins attacked him, cutting off his arm and his hand and inflicting deadly wounds to his body. He was laid at the feet of Our Lady of the Seven Sorrows where he expired. The body of Garcia Moreno was placed in a secretly and provisionally unknown grave in order to protect it from the risk of sacrilegious profanation. While we may not have the courage today to die for the faith, let us begin simply with the Rule of life set out by Garcia Moreno in his youth. 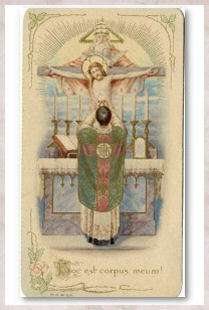 Faithful to this Rule, with the strength of God, we will rise to the height of martyrdom, if and when we are called.